© Varja Linnea Askeland | All material is copyrighted and not to be used without permission. All rights reserved. I’m finally finished with my portrait of Tom Cruise as the vampire Lestat in Interview with the Vampire. 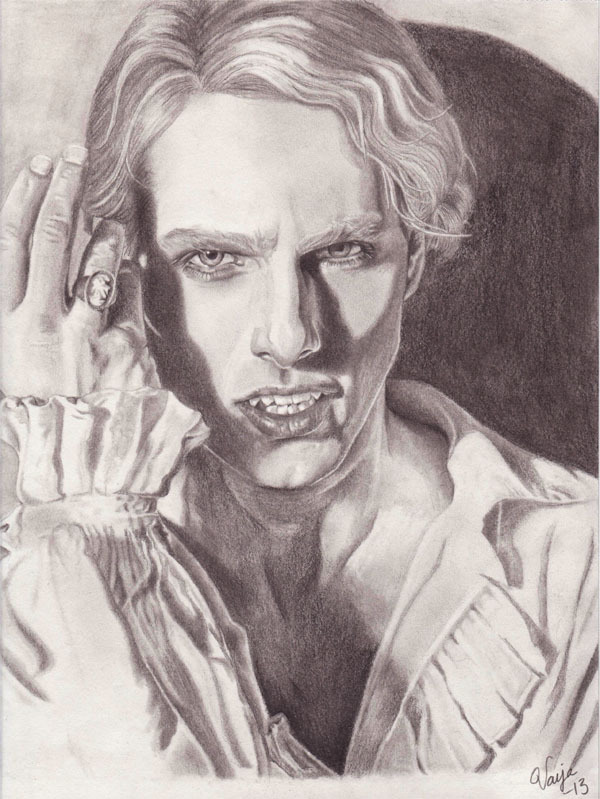 It was a very hard portrait to draw, since Tom Cruise is very hard to draw and even harder as Lestat. Like I wrote in a previous post, I’ve loved vampires since I was a little girl. My two favourite vampire carachters are Lestat and Spike in Buffy the Vampire Slayer. I drew the contours with my trusty 0.7 mm pencil, the soft and dark shadows with Monolith, Cretacolor and Charcoal pencils. ©Varja Linnea Askeland, 2013. All rights reserved. Unauthorized use and/or duplication of this material, in part or in its entirety, and any such derivative material, that appears here or has appeared here without express and written permission from this blog’s author and/or owner is strictly prohibited. All material is covered by international intellectual property laws. Failure to comply with this will be taken as copyright infringement and plagiarism and acted upon with all and full legal means. Excerpts and links may be used, provided that full and clear credit is given to Varja Linnea Askeland and with appropriate and specific direction to the original content, and the author is informed. Permission to reprint in full, or part, must be requested of the author in advance.